Go Kits, Everything in one box ? eHam > eHam Forums > Emergency Communications > Go Kits, Everything in one box ? I'm of the opinion that a go box should not be all inclusive. I'd rather have one box for HF and another for VHF/UHF. Trying to monitor and operate two different modes of communication from one box at the same time does little to insure 100% accurate copy or even checking different frequency's. A scanner that is also separate from either box would be preferable. Two people in one box makes things awkward for both operators, and in most places, you should be using headphones with boom microphone when possible. At the least, headphones for best copy. I'd rather operate one or the other and have another operator on whatever piece of equipment I'm not using. Both could contain digital modes. Trying to copy too much at one time will compromise the transmitted information, especially weak signal. One person could still operate both if necessary and a single power supply with enough capacity could also operate all equipment. Separate power supplies would still be the best set up if power is not an issue. A third box for wire antennas, jumpers, and other accessories would round out the package. Having everything in one box looks cool, but in practice makes for confusion. Something that is not good when what you copy and transmit could impact someones life. It does involve some duplication as to separate digital equipment and maybe a second power supply, but with two portable computers or tablets, it also give you the ability to operate digital on both modes. RE: Go Kits, Everything in one box ? My thoughts exactly. 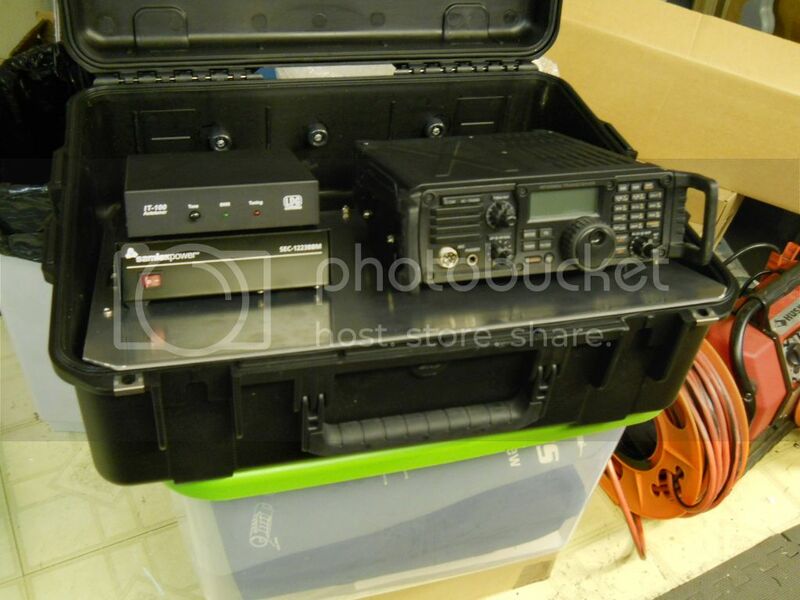 I have a SKB case set up with power supply, tuner, and HF rig (Icom IC-7200). 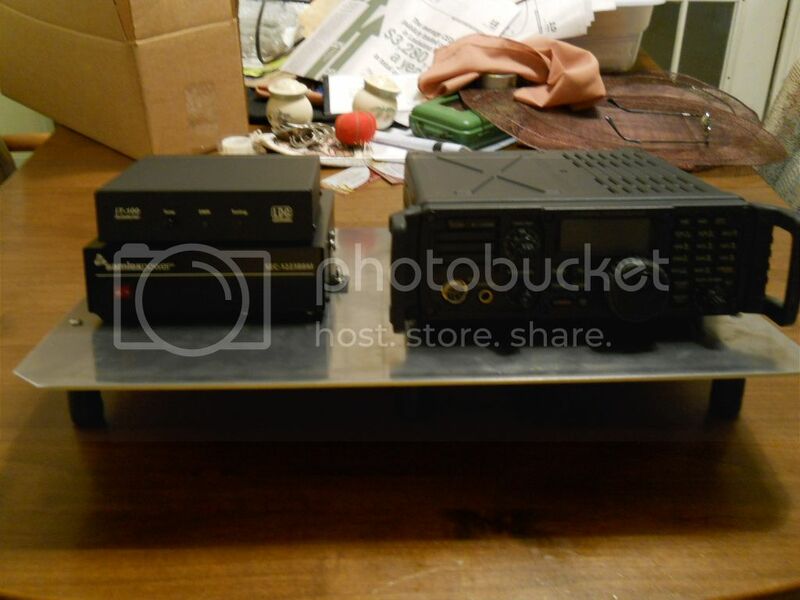 for a 2 meter rig (Yaesu FT-1802M) that can be set up farther down the table. area, other accessories, and all that is carried separately in a laundry basket. KISS. When I put my box together, it was with an eye towards the various forms of portable operation I was expecting to do -- Field Day, race support, ARISS, other satellite work, drive-up-hilltop VHF contesting, MARS drills, etc. My goal was to have something that I could set up / break down with a minimum of connecting/disconnecting of gear. The problem I ran into was that given the range of uses I was trying to cover, I couldn't cleanly segregate my gear to be quite that modular, without leaving myself with a lot of the disconnecting/reconnecting of gear that I was trying to avoid. Someone with more focused design goals, or better fabrication skills could probably have pulled it off, however. Maybe next time I do this, I'll limit my focus enough so that I can have separate (and lighter!) HF/VHF/power boxes. 1. A field station should aim to have enough operators such that you can have (number of frequencies to cover + 1) operators on duty. For example, if you're covering one phone frequency and one data frequency, you probably want to have at least three operators on duty at any time: one for each frequency/mode, and one to log traffic, cover bathroom breaks, etc. 2. When hams are involved, it IS possible to have too much gear on hand. If every operator brings separate phone/digital or separate HF/VHF boxes....there are going to be a lot of boxes. Having some spares isn't a bad thing -- Murphy does like to show up at inopportune times -- but there is a point where wasted space and effort becomes a problem. 3. 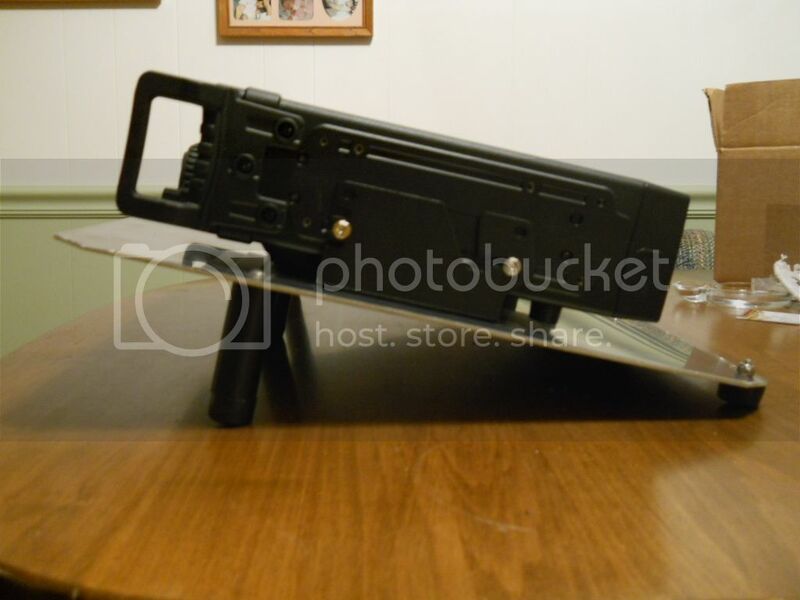 Radios with detachable heads make it easier for two operators to work out of one box. That being said, mind the power budget for such an arrangement. I have more than one radio in my box, but I wouldn't want to TX more than one signal at a time.